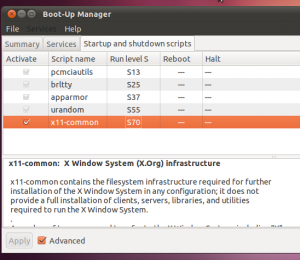 How to Edit System Boot-Up Services in Ubuntu Linux? GNU/Linux OS is a lot “inspired” by the old and stable Unix system thus it inherits a number of architectural features from it. 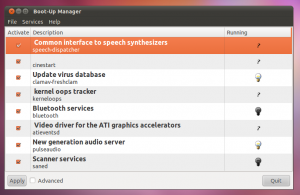 Concerning the PC boot-up process, GNU/Linux run core components of the OS (known as “system services”) according to a protocol called “Run-level”. There are approximately 7 run-levels (from zero to six) but it’s not a necessity that they should be executed in a sequential manner. Each run-level holds its own programs (services) that are only executed when that run-level is being called for. 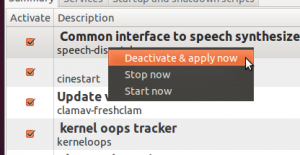 Now I won’t go into all the heavy details but like most other users, if you use Ubuntu Linux and already know about system services and probably been wondering how to manually change/disable so you can speed up Ubuntu a little then this post is for you. Now there are few utilities available but the one called “Bum” (stands for Boot-up manager) can be extremely handy for that purpose. *. Has a pretty simple interface and lets us enable/disable system core services with ease. *. 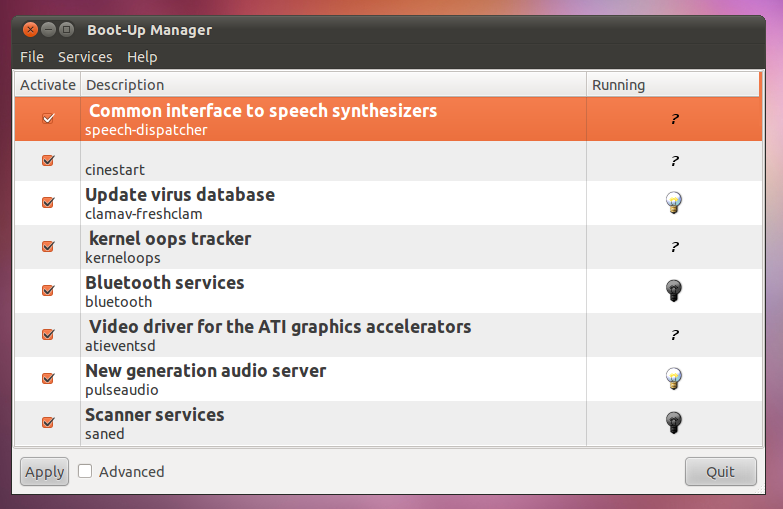 Displays short description about services (not all the services are supported). *. Has an advanced interface that shows services that exist in all the run-levels. *. Change start/stop priority of services. *. 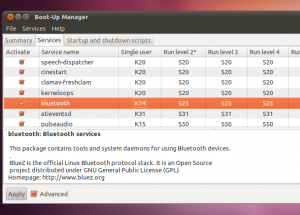 Temporarily disable running services (they’ll be run in the next system boot) or disable them permanently. Yep that’s about it for the features. You can install Bum boot-up service manager in Ubuntu 11.04 Natty Narwhal, 11.10 Oneiric Ocelot, 10.10 and 10.04 by using the below command in your Terminal window. Now, after installing the app we gotta run it with administrative privileges. For that, simply press “Alt” + “F2” keys and enter the below command and press Enter and when asked, give the admin password (unless you’ve changed settings manually, this means the password of the first user account that you created while installing Ubuntu). But, isn’t it a bit “risky” to use such a program?? True and if you don’t know what the heck you’re doing, then please don’t use it because it can easily make your GNU/Linux OS unbootable!. But then again, there could be occasions where you can easily disable few core OS services (that you wouldn’t probably use -- scanner related services for instance) which can help to speed-up the booting process itself. It also lets you remove entries which are simply “left overs” of programs that you had removed previously (in my case, I had two of them actually). So not just for speeding up but when properly used, it can do some handy “system cleaning” too. What a handy “Bum” after all ;-). Ubuntu Software Center is Selling e-Books & Magazines!